The MC520RL-DA is different in design from the MC500RL-DA - because it has one coin cup. All coins and/or tokens are dispensed into the same coin cup. It is a great machine that can be used in commercial coin laundries or car washes for use with self-serve bays or for vacuums and vendors. With two steel coin hoppers, holding up to 6,400 quarters ($1,600 capacity), and the solid welded steel cabinet has a stainless steel face-plate for added security. The MC520RL-DA can dispense coins, tokens or a combination of coins and tokens. 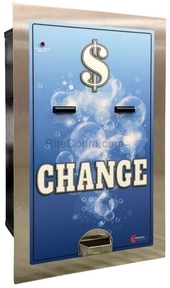 Some customers have set up the MC520RL-DA to dispense a combination of quarters and dollar coins.